Wow! This is fantastic news. Congratulations! I am half way through. I bought a few days ago and cut the queue of all the books I’ve stacked to read and even a couple I was reading. It’s compelling and beautiful. I’ve been reading it in small doses before bed – only a few chapters because I want this pleasure to last. I’ve got your back at the B&N in Connecticut where I work — will keep my eye on it and tell everyone what a great book it is — and make sure that when we run out, we get more. It’s a lovely book – congratulations! Thanks David for buying it and reading. I hope you enjoy it! Congratulations! Enjoy this day and maybe even celebrate it every year, like a book birthday. I can’t think of many better reasons for a slice of cake and a glass of champagne. Word of mouth can work too well. I flourished Our Endless Numbered Days at a friend who was staying and she has walked off with it. Fantastic… any plans for Sweden? Love, love, love this book! Have recommended it to everyone I speak with, and have my book group reading it… totally sucked into the story, and love the excellent, beautiful, classic Claire Fuller-writing. So delighted that your enjoying it! Have you finished it yet? And thank you so much for spreading the word. No, I’m about 1/2+ through… haven’t had a lot of reading time this week! But, when I do, it’s with me. 🙂 Happy to spread the word, when something’s good! 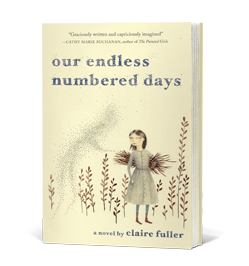 Hi Claire – I am commenting on this nearly 2 month old post to let you know that I just finished Our Endless Numbered Days last night. I cannot remember what book blog recommended the book, but I immediately looked it up. Upon reading the synopsis, the strange premise hooked me and I immediately put the book on hold at my library (in fact, I think I may have been the first person lucky enough to check it out!). And… woah! The story is gripping, unsettling, and unnerving. Your characters were so well crafted and left me with clear images in my mind of what they looked like, and your writing is haunting and beautiful. I finished the book last night just before bed, had an insane night of dreams (no doubt influenced by the twist ending of the book! ), and am still thinking about the book at 4:00 p.m. the next day! Thank you for your words and for one of the more memorable books I have read thus far this year! Very excited to have come across your work and to see you have a blog as well! Cannot wait to read your future books. Thank you so much for taking the time to let me know – I’m delighted that you liked it, and that it’s stayed with you. (And a cheeky request – if you have the time I would be very grateful if you could write an Amazon review. It only needs to be a few words, but they all help with book ‘discoverability’. I definitely will, Claire! Happy to spread the word!